Emma Willard House is home to the Admissions Office. MIDDLEBURY, Vt. — Middlebury has offered 287 students early admission to the Class of 2018 from a pool of 686 applicants. The admitted students represent about 44 percent of a class that is expected to total just under 650. The College deferred 96 applicants, who will be considered for regular admission in the spring, and denied admission to 303 students. Acceptances offered under Middlebury’s early decision program are binding, which means that students who apply are signaling that Middlebury is their first choice. Last year Middlebury College received 699 applications for early decision and admitted 294, which accounted for 42 percent of the class. 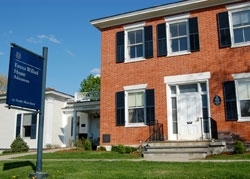 Middlebury College Dean of Admissions Greg Buckles said that the 287 accepted students are from 35 states, Washington, D.C., and 19 countries. “We’re especially pleased with the success we’ve had in reaching out to international students,” said Buckles. “As a group, they tend to apply regular admission, but this year we accepted 21 international students early decision, an increase of 50 percent over last year.” International students represent about 10 percent of Middlebury’s student body. The College will award up to $3.2 million in need-based financial aid to students admitted early decision. Students learned of their admission by logging onto a special website starting at 8 a.m. on Saturday, December 7. Mailed letters arrived at their homes last week. The deadline for regular admission applications is January 1.